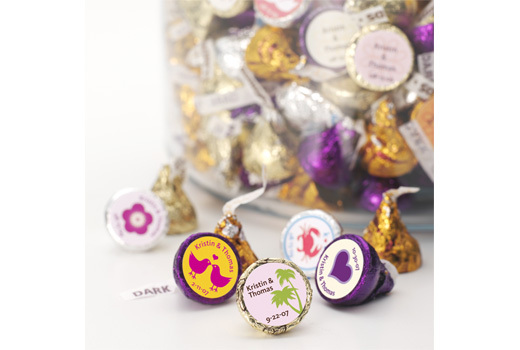 Share sweet kisses with your guests with HERSHEY&apos;S© most famous chocolates, made especially for your wedding day. 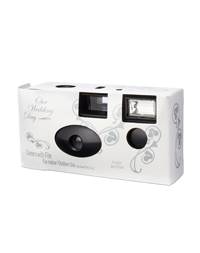 Choose from 39 designs to customize with your names or initials and wedding date. Available in 5 of HERSHEY&apos;S© top flavors - Milk Chocolate (silver foil), Milk Chocolate with Almonds (gold foil), SPECIAL DARK Chocolate (purple foil), Filled with Caramel (bronze foil with brown stripes) and HUGS Chocolates (silver foil with brown stripes). Sold in bags of 100 pieces. To Reduce Risk of Melting, Please Note: From 5/1 thru 9/30, all chocolate MUST ship minimum UPS 3-Day Select. We strongly recommend rush shipping any time of year to reduce risk of melting.